Now steady yourself for some groundbreaking good news: open a Diamond Treasure Box to get the more powerful Eternal Emblem! This Eternity Emblem may look the same but it can NOT ONLY upgrade your time-specific wings into FOREVER ones, BUT ALSO transform your FOREVER Wings into the NEW Angel of Fire Wings (FOREVER)! 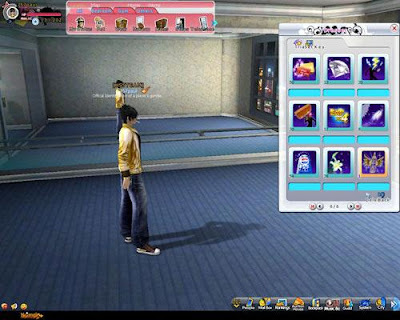 From 11:00 on 1st December to 23:59 on 7th December, 2009, whenever you top-up the amounts stated in the table, you will get Diamond Treasure Box for FREE. 3. Diamond Treasure Box: You get all kinds of hot in-game items (Eternity Emblems, Fallen Feathers, Butterfly Wings, Super Megaphones, etc.) randomly from a Diamond Treasure Box. Reply to the Forum Thread with a screenshot in the format shown below and contact GM as soon as possible when you get an Eternity Emblem. 1. 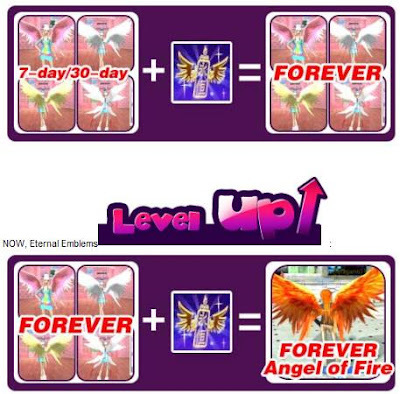 ONLY FOREVER Burning Angel Lucifer's Wings, Fluttering Pink/Yellow/White Angel Wings can be leveled-up to FOREVER Angel of Fire Wings. Please make certain that the FOREVER Wings you want to level up to Angel of Fire Wings are in the item slots. 2. Please note that BLACK Wings, White Angel Wings and Fluttering Blue Angel Wings CANNOT be upgraded into FOREVER Wings with the Eternal Emblem. Please also make certain that the time specific (7-day/30-day) wings should be kept in the mailbox if you want to upgrade them into FOREVER Wings. Once accepted, they CANNOT be upgraded. 3. The Eternity Emblem CAN be auctioned off at the in-game Auction House. 4. When you get the upgraded wings, the original wings (7-day/30-day/Forever Wings) will be deleted. 5. Deadline for Eternity Emblem Screenshot Submission: 17:00 20th December, 2009. 6. You have to reply to the Forum Thread with the screenshot in the format shown above before 17:00 20th December, 2009. Late submission will NOT be accepted. 7. Eternity Emblem verification will take some time, so it is likely that you need to wait for a while before your Wings can be upgraded to FOREVER Wings. GMs will handle the verification and upgrade as soon as they can.